My pup doesn't make it onto the internet too often - poor thing hates having her photo taken and has gotten to the point where she's almost too deaf to hear someone call her name to look in the direction of the camera! You may remember her here with her summer hair cut. Anyway, Sugar Plum came with me to pick out a Christmas tree - really, she just sniffed them. I've gotten North Carolina Fraser firs in the past but this year I picked out a Washington Douglas fir. Can't wait to share the tree-decorating photos soon! Have a wonderful weekend friends. Aw she is so cute! I love that bow sweater on you, and these are the perfect Christmas photos! You look so adorable in this outfit! Such a perfect sweater for the holiday season. You pup is so cute!! this is so cute! and what a pretty dog! loving your bracelet. elephants are my favorite animal. 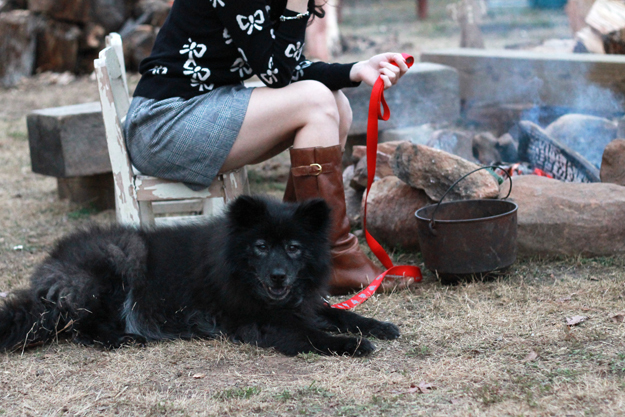 Cute boots, cute puppy and really cute photos! Aww, Sugar Plum is so adorable! 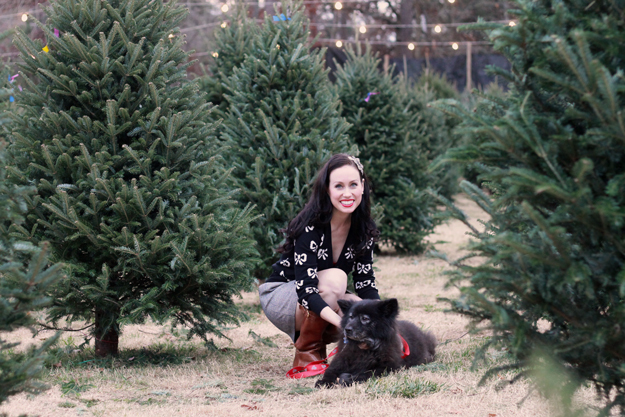 And I think it has got to be every dog's dream to go Christmas tree shopping. "You mean I get to sniff every single tree here?!" 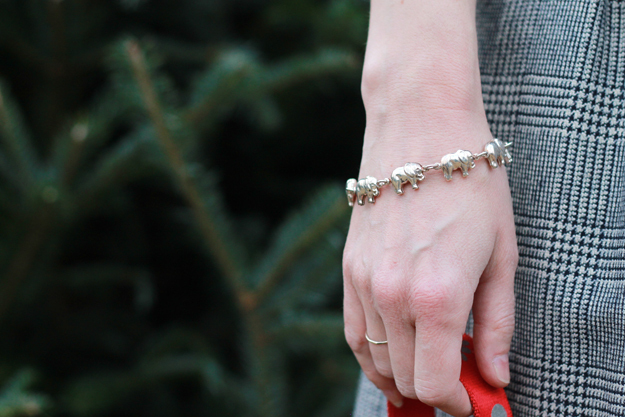 adorable outfit to go pick your Christmas tree in. Also you dog look so cute. Love the color combo w the mix of brown and I love anything with bows!! You look absolutely adorable. I love your cardigan and your boots. Your dog is so precious. Awww tree shopping! I will be putting up my tree from 2004...the 4ft artificial tree...ahhh! I love your sweater and your doggy is beautiful! Love the photos with the Christmas trees in and your lovely outfit. Your dog is super cute! Great photos, and Sugar Plum is so cute.